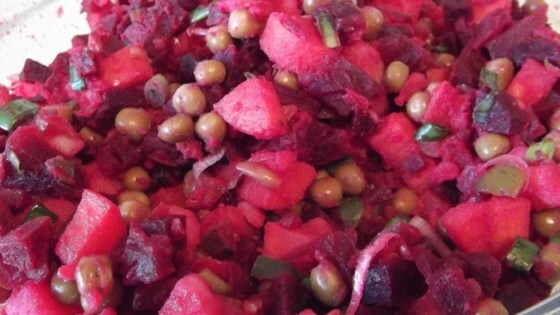 "A delicious Ukrainian beet salad! Great with meat and poultry dishes (especially Chicken Kyiv) with a side of mashed potatoes! The preparation takes some time, but I really like the salad! It is one of the few salads popular in Ukraine that doesn't contain mayonnaise! Enjoy!" Place the beets into a large pot and cover with water. Bring to a boil over high heat, then reduce heat to medium-low, cover, and simmer for about 20 minutes. Add the carrots and potatoes. Boil for another 10 minutes, then cover the pot and leave overnight. The next day, peel and dice the beets, carrots, and potatoes into small, even pieces. Place the vegetables in a large bowl. Stir in the pickles, onion, peas, olive oil, salt, and pepper. Garnish with parsley before serving. Good as is, but we usually omit peas and add sourkraut (russian style, of course). Definitely good and good for you.